This live recording definitely lands under metal because most of the music fits. 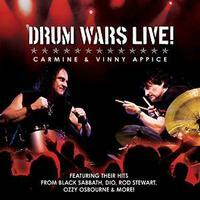 It’s a live performance of brothers Carmine and Vinnie Appice. Since they are both drummers, this is a percussion heavy recording. It’s definitely well suited for fans of drums. I’d say that it seems that the music beyond that is a bit of an afterthought. There are some good moments, but the rest of the performers don’t seem of the same caliber as the Appice brothers. Still, killer drumming is the main idea, and there is plenty of that here. Combining dramatic music with a wrestling type tongue-in-cheek introduction, this is fun. They scream out into this Black Sabbath classic. I’m not crazy about the vocals on this, but the thing is seriously on fire. It’s harder edged, even than the original was. The jam later in the piece gets pretty busy in terms of drumming. Given the theme here, though, that’s to be expected. This is a powerhouse jam with just the shouted “drum wars” for vocals. While the drumming is intense, there is some smoking guitar, too. It does have some full on drum soloing, as well, though. In fact, that section is the bulk of the piece, and this is an extended number. The vocals work a bit better this way, but the tune is a bit more raw compared to the original rendition. It’s much more pure metal for sure. Here is another screaming metal take on Dio. The vocals here are even less effective than they were on “Mob Rules.” Still, this is about the drumming really, and that’s exceptional. This is a full on drum solo, but with both drummers wailing. Now Carmine gets to show off by himself. This time they turn to the music of Ozzy Osbourne. This is closer to the original than the other tracks were. I like this one quite a bit. In fact, it’s possibly my favorite tune here. It’s definitely got some of the best guitar soloing of the album. A metal version of the classic Rod Stewart song, this a little raw, but quite cool. I love the change of “musical scenery” here. The audience gets to sing along later in the track, too. There is almost a Beastie Boys kind of vibe here at times, though. Now, we are taken back into the warring of drums. Vinny Appice gets a chance to show off with his drum solo here. This Dio/Sabbath two-fer is delivered pretty well. The vocals on the little section of “Heaven and Hell” (they just do the non-lyrical chant part) are a bit hard to take, though. Still, like I said before, this is about the drums, and they are awesome. We’re back into Ozzy territory here. This version is pretty good, but the vocals leave a bit to be desired.